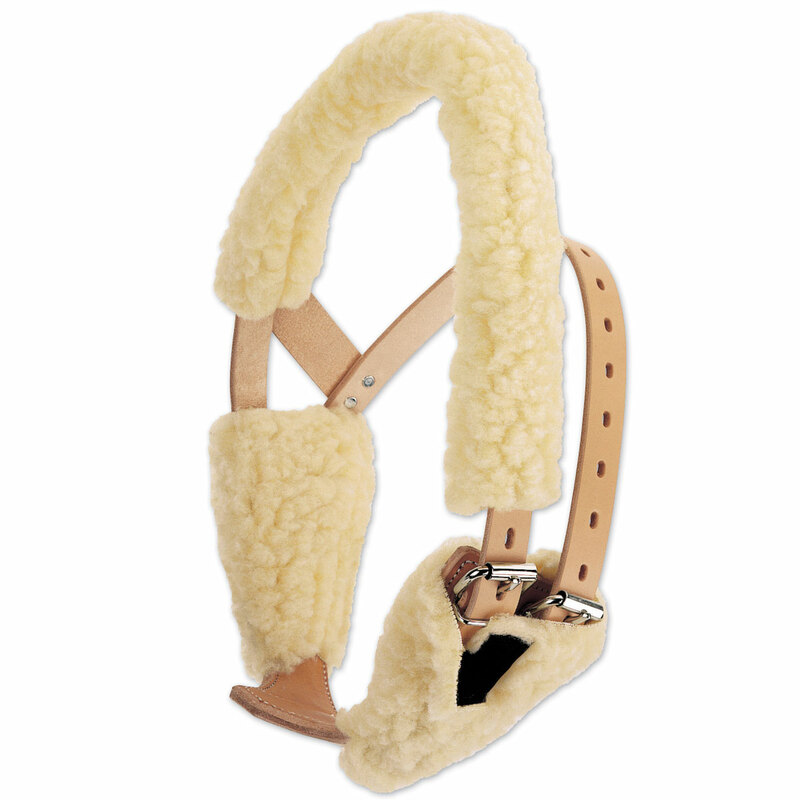 Washable maize fleece browband and jowl Miracle Collar Fleece Covers provide extra cushioning and protection. Browband cover simply slips over Miracle Collar's browband. Jowl covers attach with self-gripping VELCRO® Brand closures. Will fit medium and large Miracle Collars. Help break your horse of his bad cribbing habit! Hydrophane Cribstix puts an immediate halt to crib biting, gnawing and other bad habits. Made in England. Standard high quality fleece cover with COOLMAX® lining. Weaver Leather Miracle Collar Fleece Covers is rated 3.2 out of 5 by 26. Rated 1 out of 5 by Sara from Disappointed in quality and fit I read the poor reviews on this product and decided to purchase anyway. My horse has to wear his cribbing collar 24/7 and was starting to get rubs. I figured the cover would be better than nothing but sadly it only lasted a week. The velcro doesn't stay closed and the side pieces are too big. Also, somehow he is able to slide the browband over his ears when the cover is attached. If anyone has found a better solution to prevent rubs from the miracle collar I would love to hear about it! Rated 5 out of 5 by dconley from Keeps his skin in good shape. Appears to give him more comfort. Rated 2 out of 5 by RAWALLA from I ended up returning this item. Unfortunately the quality of fleece wasn't to my liking. The fibers shed easily and I was afraid my horse would end up eating them along with his hay. Rated 3 out of 5 by tazzy1023 from Ok but has drawbacks While these sound like they make sense they change the fit of the collar aand make it hard to allow the collar to be worn outside due to weather, bugs, mud rolling, etc. Rated 1 out of 5 by BreesMom from Flimsy and not effective Did not fit right. Material very flimsy and cheap. Worthless. Threw it in the trash after one day. Rated 4 out of 5 by TopBrass from Works for some horses I have used one of these before with success, but it did not work for the horse I purchased it for . Maybe if i had cranked it tighter than I am willing to. I have actually had success with curbing cribbing with Smart Gut on another horse. The cribbing was really associated with feeding - even carrot treats. I tried Smart Gut along with alfalfa forage added to the low starch diet and the cribbing ceased. I am hoping I will see the same results after a while with this new horse that I just acquired. Rated 4 out of 5 by Nora from Soft & cozy Scooby is such a bad cribber, he can't go without his miracle collar, but his hair was wearing away! He is so much more comfortable in his fleece cover and the hair seemed to stop wearing away and it did not change the effectiveness of the collar. The only problem is that it slips off very easily when taking it off or putting it on. You do get the hang of it eventually, but I think if it were more adjustable with Velcro it maybe more user friendly. Rated 1 out of 5 by Obsidian Fire from velcro comes off In the first day my horse rolled, rubbed his head on the ground, and that was the end of the cheek pieces - the velcro did not keep them on the collar. I ended up using a fleece girth cover I had, cutting it to fit, and that worked perfectly. On a side note, the collar had rubbed raw sores on the side of his throatlatch area which is why I covered his collar with fleece. Rated 3 out of 5 by Nonma from Fleece Fleece is thin and artificial. Does not prevent rub marks. Rated 4 out of 5 by Callie12 from Helps with chafing The cribbing collar itself is a necessary evil, my 13 yr old mare, with a long history of windsucking/cribbing, dislikes it intensely. The fleece cover helps reduce chafing as she rubes the collar on the stall. She has a narrow head and I had to cut the brow band section - maybe there's a market for a medium to small size?